Welcome to part three of the Outbreak Developer Series. This series of topics will focus on exploring different aspects of the Outbreak game experience. Today's topic is about how Outbreak purposely depowers the player. Player depowerment is a central concept for survival horror games and is one of the primary drivers of tension and difficulty. Many video games seek to overly power up the player character, through special moves or incredible weaponry. Survival horror is about embracing the polar opposite of that. Forcing constraints on the player causes them to weigh their decisions more carefully, especially when dealing with limited supplies, small carrying capacities and dangerous scenarios. It's one of the central components that enhances "fear-inducing" elements from games, causing fear of the unknown because of your frailty. Often times, you will be in a position where you cannot see the majority of the room you're navigating. Each player has a flashlight with unlimited battery power, but the area that the flashlight covers is small. You will find ambient lighting in rooms from computer screens, laptops, televisions and other service lights. What you won't find though is well lit surroundings that show you everything. It's the inability to see what lies ahead, coupled with being unsure that your prior location is still safe, that adds a significant amount of tension in Outbreak. Although you can run, you'll likely find that it's far more dangerous than walking at a reasonable pace because you may get surprised by a hidden enemy or environmental trap more easily. One of the primary ways that Outbreak purposely depowers the player is through movement controls. Outbreak utilizes "tank controls", meaning that you can move forward, backwards or turn your character. You do not have full freedom to move in any direction at any time. This adds a layer of complexity and frustration when you're attempting to flee a suddenly dangerous situation. 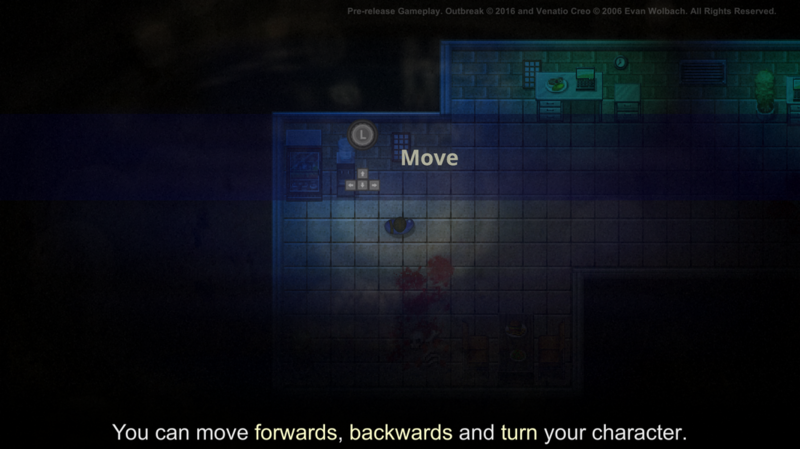 Outbreak aids the player with a "quick turn" maneuver, which allows you to quickly rotate 180 degrees. Outside of that though, your movement will be purposely less precise as you attempt to navigate the environment and flee from dangerous situations. This increases the tension, adds a slight bit of frustration and forces the player to more carefully consider how they're positioning their character. In Outbreak, you must "ready" your weapon before you can fire or swing it. Readying your weapon takes a bit under a second and forces you into a state where you're defenseless. Once your weapon is readied, you can rotate to aim, but you cannot move until you exit the readied state. This purposely does not allow the player to make split second decisions on attacking foes and further forces them to maneuver into strategic positions before engaging in combat. When you're surprised by an enemy, you will find yourself at a significant disadvantage because you can't quickly open fire. This system will force you into making a split-second decision to fight or flee. Often times, it is beneficial to attempt to gain some distance from foes before attempting to fight them. Most times, it's more effective to just flee from the battle and attempt to avoid it. You'll notice that many of the menus you use when playing are purposely designed to obstruct your vision of the game. In addition, the game never pauses at any point, meaning that you aren't safe while navigating your inventory or looking at your teammates inventories. The purpose of this is to place a cost on interacting with elements outside of the game world. It forces the player to be strategic about when they use their inventory, specifically in terms of reloading weapons, healing or using puzzle items. When playing with friends, you'll often times want to request that they cover you while working within your inventory, otherwise you may find yourself taking significant damage when you return to the game. 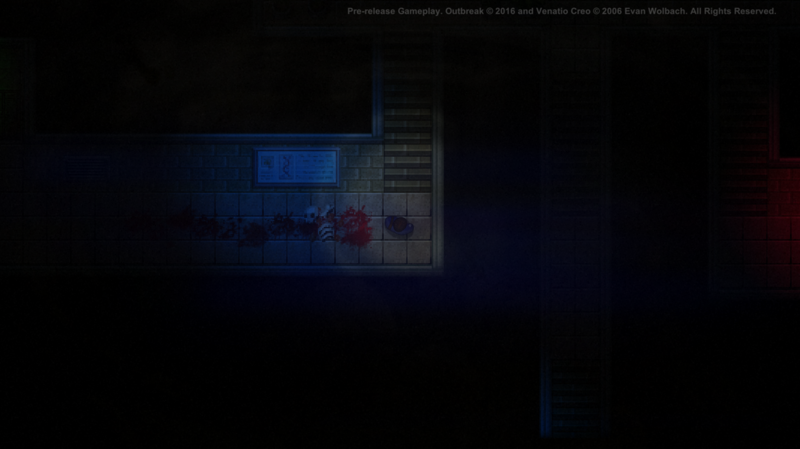 To further complicate matters, Outbreak has virtually no heads-up-display during most of the game play. You will be able to view your current location and your current objective, but not your health, ammo, inventory or other statistics without accessing your inventory. This forces the player to stay cognizant of their supplies and state while they play the game. For example, you can reload instantly by combing ammo and firearms in your inventory. But if you run out of ammo during game play and attempt to fire, your character will reload their weapon in a lengthy sequence. This punishes the player for either not being aware of their remaining ammo or for forgetting in the heat of battle. This also adds a cost for viewing this information, as it will take your attention and view away from the immediate game. Outbreak differs from many typical games because when your player is killed, you cannot simply "restart" from a checkpoint. Death is permanent during the level and the only way to resume play is to either have your teammates beat the mission or to restart it. When you perish though, your inventory will be dumped at the feet of another player in the game, ensuring they can benefit from your equipment and puzzle items. The fact that death is permanent makes managing your player, sharing supplies with others and working together paramount. if you separate from the team and die, the rest of your team will be significantly weakened and their survival will be put further at risk. Player depowerment is a staple of survival horror and serves an important function in adding tension to the game experience. By making the player feel fragile, it reinforces the importance of strategic decisions while amplifying the punishment for failing to do so. Although it may be considered unfair by some, it is an important tool for ensuring that the game experience is engaging, challenging and fun. You typically cannot see much of the room. 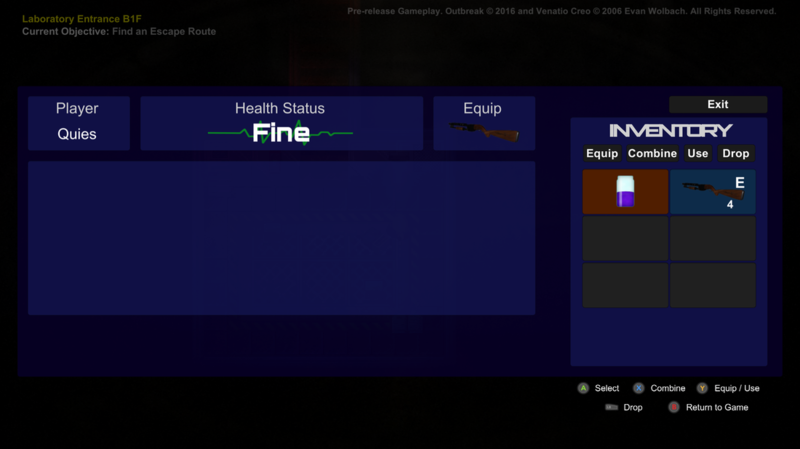 The inventory view obstructs most of the screen.